I was thrilled to be the “mentor of honor” for my friend Rachael Carlevale when she and her hubby, Matt Davenport, pulled off a magical cannabis wedding in Colorado late last summer. As such, I helped Rachael create goodie bags for her bridesmaids, whom I dubbed “budmaids” for the occasion. 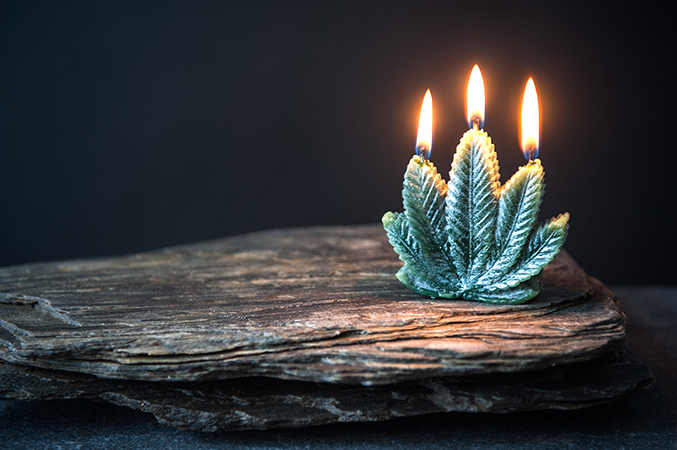 Rachael and Matt are among a handful of brides and grooms in legal states like Colorado and Washington who are incorporating bud-tended weed bars, cannabis-infused edibles, cannabis-pairing dinners and cannabis floral arrangements into their weddings. It’s more than a trend—it’s a movement—and I’m pleased to predict we’ll see many more of these now that California, Massachusetts, Nevada and Maine voted to legalize recreational cannabis. Congratulations to all those forward-thinking states and thank you especially to all the citizens who voted intelligently. 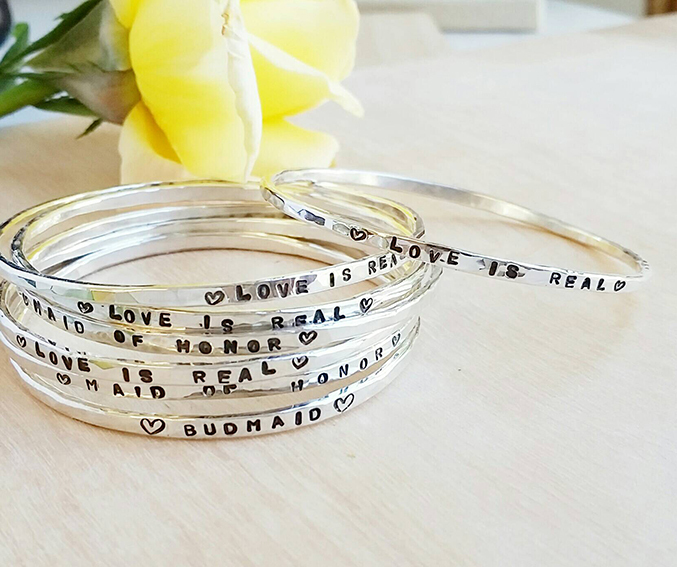 Artist Holly Gonnella handcrafts, hammers and stamps these elegant and discreet personalized bangles made from recycled 10-gauge Argentium sterling (a very nice weight for a bracelet) in her southern Oregon studio. 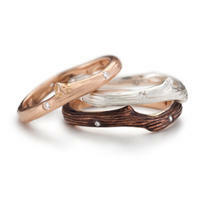 She made our “Budmaid” bangles to spec, and the lettering is oxidized. 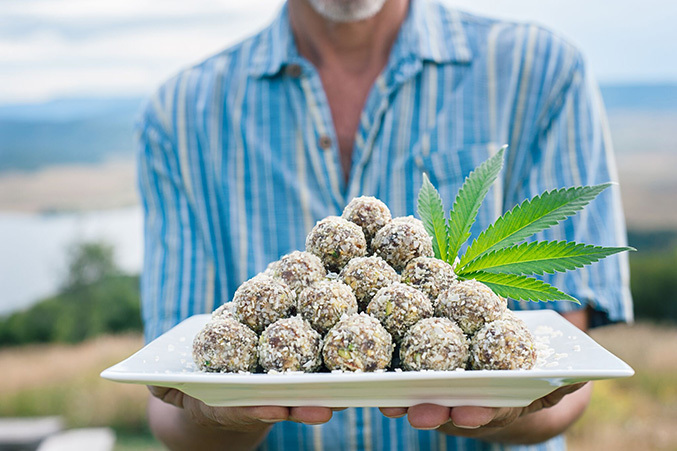 Handmade by the Medicine Hunter, who officiated at the wedding, these divine cannabis-infused confections are one of Chris' most popular recipes from The Cannabis Kitchen Cookbook (above). Chris patiently hand-chopped the fine organic ingredients, which included regenerative cannabis cultivated by the groom. 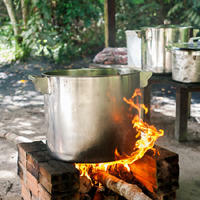 “The energy that goes into cooking is part of medicine,” Chris says. His exotic, super-powered aphrodisiacs were inspired by Richard Burton’s translation of The Arabian Nights, and they will take you on a magic carpet ride! 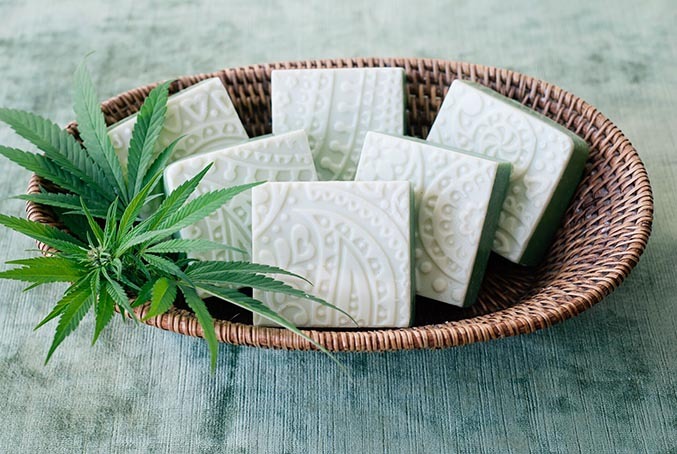 Kimberly Mead of Scentapy used a henna-patterned bar mold to handcraft these organic, vegan, cruelty-free hemp seed oil soaps using certified organic hempseed oil and organic lavandula angustifolia esssential oil from Mountain Rose Herbs. 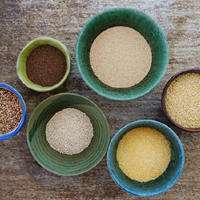 Mead develops her own recipes and controls every ingredient that goes into her soaps. 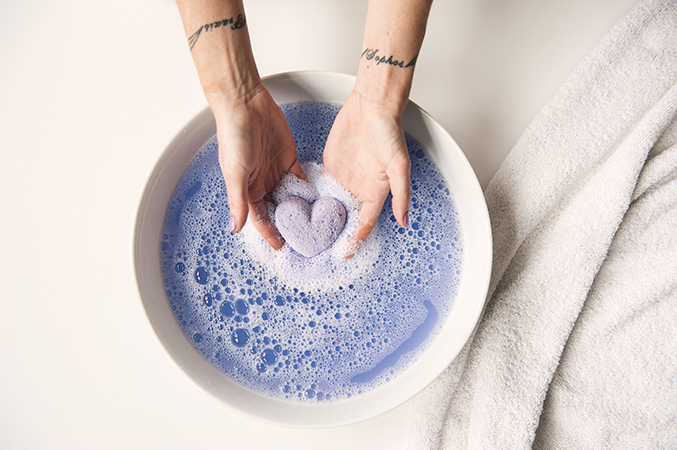 “My passion to create bath and body care products was sparked when I learned about how many harmful and harsh chemicals are in most commercial products,” she says. 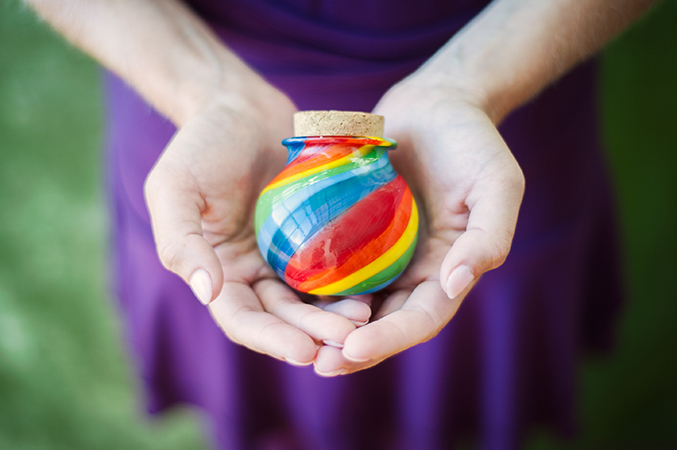 Neon Lady made each budmaid a charming chakra rainbow stash jar so they would have meaningful containers to hold a special Pemalos cultivar grown by the groom for the occasion. Neon Lady loves playing with molten glass and making containers that people will get as much enjoyment out of using as she does making them. Each stash jar was filled with special, regenerative cannabis flowers grown for the occasion by the groom, Matt Davenport. 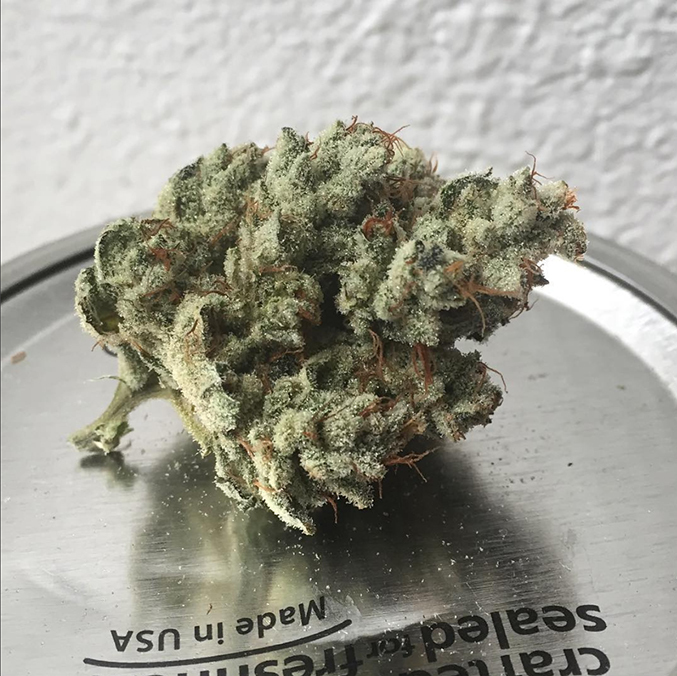 Founded on the principles of permaculture, Matts company, Pemalos, values cannabis cultivated in no-till, living organic soil and grown with methods that are mindful of people, the plant and the planet. 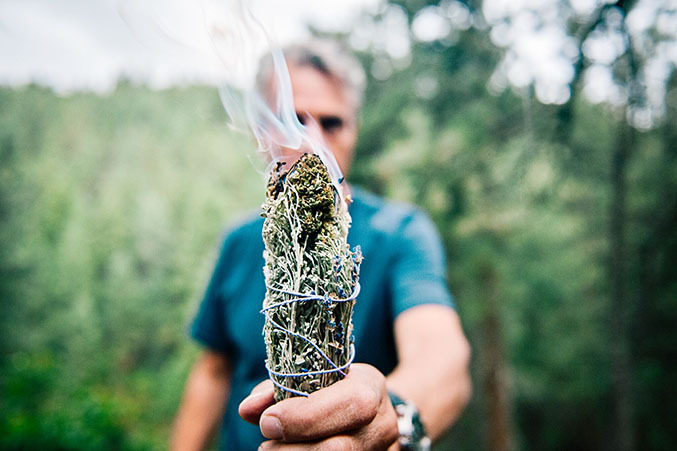 Joni Fosbenner of TreeStuff grew the sage and lavender for these smudge sticks in southern Oregon’s Siskiyou Mountains. Sage consecrates sacred space and maintains positive vibrations, while lavender purifies and brings peace, happiness and love, she explains. “But of all the herbs in the world,” she says, “cannabis is the most medicinal.” Shipping cannabis across state lines is illegal, so we added the groom’s cannabis buds on site. Ma Indica of Indica Sanctuary handcrafts these moisture-rich lotion bars with organic ingredients such as hemp seed oil and geranium essential oil in Florida. 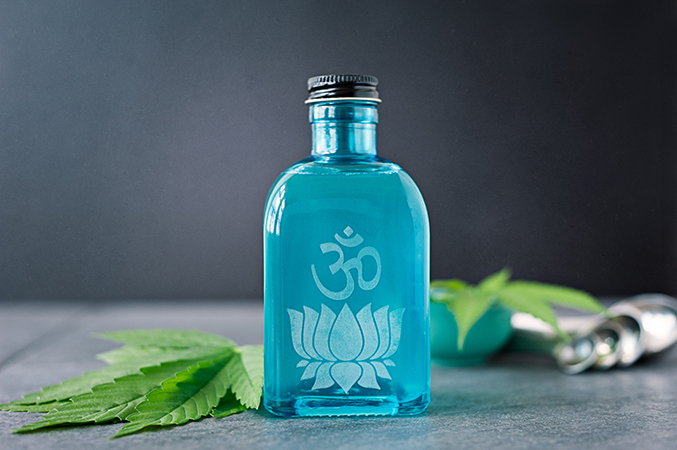 “Hemp aligns with everything I believe in, and these balms and lotions are planting seeds of awareness in others,” she says. Ma Indica also tucked in two types of her luscious hempseed lip balms into the boxes. We special ordered these hand-poured and carved candles made from pure beeswax and organic lavender essential oils. 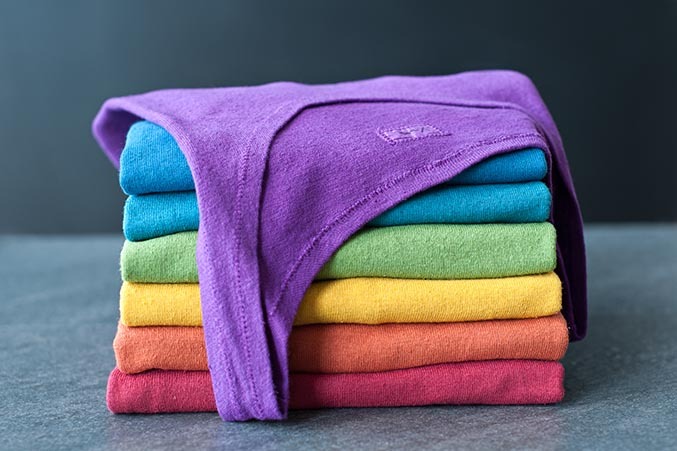 They burn beautifully and waft sweetly of honey when lit. Chemist-turned-designer Tania Hennessy’s 3D-printed molecule jewelry line, Aroha Silhouettes, turns tetrahydrocannabinol, the psychoactive component in cannabis, into wearable works of art. 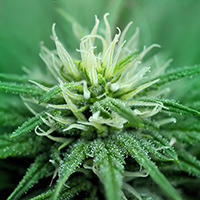 The compounds found in the cannabis plant are complex in nature. This necklace is “an artistic mash-up of cannabis compounds,” Tania says. We couldn’t resist. Shanti, the founder of XUSAH, handcrafts and dyes hemp and organic cotton clothing in a geodesic dome in Quakertown, Pennsylvania. 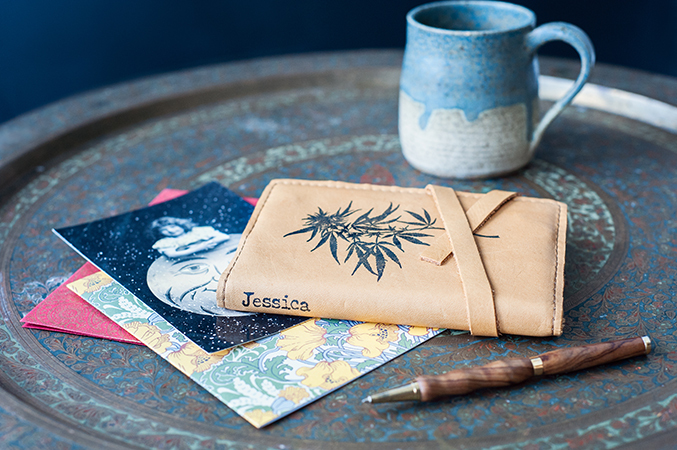 She infuses every item with “integrity, gratitude, and a positive attitude.” You can feel it. The yogini bride matched each chakra-colored tank based her budmaid’s personalities. 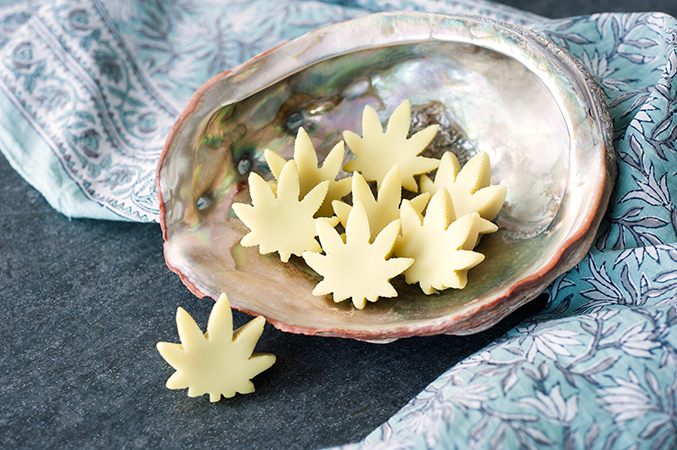 Denver-based Dominique DeLucca of Dank Essence infuses these bath bombs with locally sourced CBD oil and scents them with lavender, lemon verbena and a splash of sweet pea. “I have always described marijuana as my safety blanket, a healing, comforting essence,” she says. 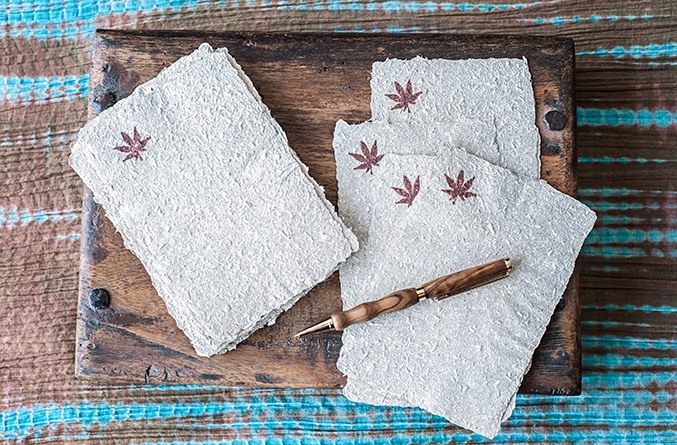 “The very first paper ever created was made with hemp,” says hemp and cannabis advocate Elishewa Shalom of Artisan Hemp, who handcrafted this paper in her Washington, D.C., studio. Elishewa cites a 1916 U.S. Department of Agriculture Bulletin stating that one acre of hemp could produce the same amount of paper that 4.1 acres of trees could over a 20-year period because hemp can be harvested once or twice every year. “Hemp can produce a dual crop making it very profitable for farmers who can sell both seed and stalk,” she explains. Doto Design’s custom-made cannabis sweetheart charms were made to order and sent to Crystal Blue Designs, where they were added to custom anklets with rainbow-colored Swarovski crystals. One of the bride’s gifts from Cosmic Sisters of Cannabis was a studio portrait photoshoot by Tracey Eller, with hair and makeup by Sarah Brown. Special props included a handcrafted contemporary Renaissance Plant Spirit Crown by organic florist Julia Moore of Laughing Moon Flower Farm (@LaughingMoonFlowers), who wove cannabis, lavender, sage and passion flower into the piece, per the bride’s request. 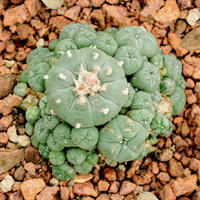 Rachael, Tracey and Julia are recipients of the Cosmic Sister Plant Spirit Grant. Special thanks to Budmaid Mackenzie Mathieu-Busher for modeling!